One mini at a time, Alex Kim is putting together a body of work that's every bit as disquieting, quirky and visually exciting as any of the new wave of cartoonists whose stock-in-trade is cerebral and/or body horror. In addition to his trademark wavy, almost vibratory line, he's added a stippling effect that gives his comics more solidity and weight. Every one of his comics approaches something horrible from a skewed perspective, bringing unexpected and frequently uncomfortable laughs to otherwise horrific situations. Let's begin with the truly outrageous Meat Bird, a story whose plot is right out of the horror cliche' playbook but whose execution is jaw-dropping. The reader is introduced to a nondescript couple who have just moved to the middle of nowhere in the woods. They stop by a creepy-looking general store that gives the wife bad vibes, but the husband is hungry and buys a chicken for roasting from the strangely silent woman behind the counter; it happens to total up to $6.66. The reader knows something bad will happen, but the sight of the bones and skin of the chicken attacking the man, the store revealed to be abandoned and the woman running it dead, and the HellChicken emerging from the man's guts was both genuinely disturbing and absolutely hilarious. Kim plays it entirely straight, right through the downbeat yet satisfying ending. 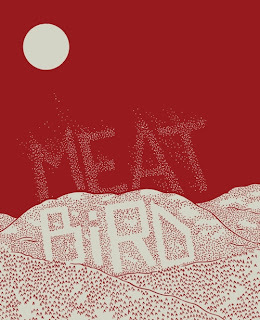 There's a lot that's visually exciting in this comic: the sharp v angles of noses and eyes; the use of stippling to create some disturbing effects from a charred bird corpse, and the clever inversion of light and dark on a number of pages. 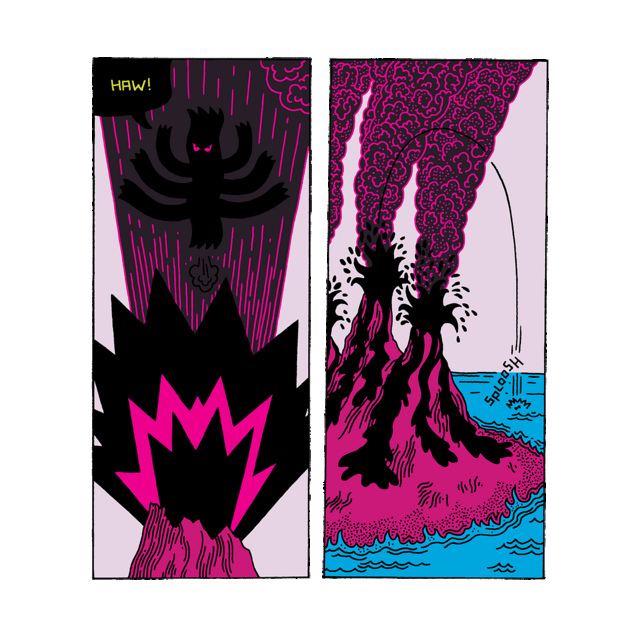 I Am Beauty is another monster book, this time from the perspective of the Cthulu-esque shadow creature that emerges to take over the body of a crayfish and fight its way up the ocean's food chain. What's odd about this one is that the monster also narrates the story, telling the reader how powerful and beautiful it is after absorbing a shark. This comic is a showcase for Kim's pure drawing chops, as he renders fish and other sea creatures with great skill even as he contrasts them with the blobby-looking elder god character. The Vault is a self-contained, color version of a story he did for Joe Lambert's Too Far anthology. Kim enjoys exploring apocalyptic scenarios, both literal and metaphorical, and this one concerns the stunning short-sightedness of one person in the wake of armageddon, only to find that loneliness does strange things to people. 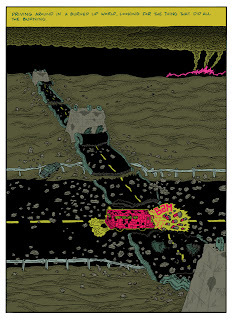 Another apocalyptic comic, Night Machine, is the most complex, haunting and visually exciting comic in this group. It concerns the paranoia of a man who appears to be living in two worlds: one where he battles ennui by sleeping with a particular girl (if only to get away from the rats) and another where he drives around in an armored bus, looking for the sinister source of that planet's destruction. The reader is rapidly flipped between the man at a therapy session, his time with his "girlfriend" and his quest to go after the monster behind everything until all three converge in an explosive and reality-bending matter. One is left to wonder if his psychosis created the real-life horror or if the horror found him, but it's interesting to see one man's fears and conspiracy theories given absolute material form. 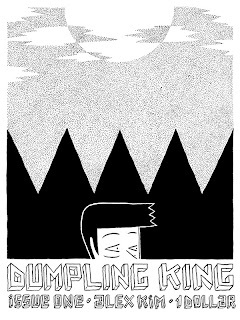 The first issue of Kim's Oily Comics offering, Dumpling King, promises a story to top everything else he's done. 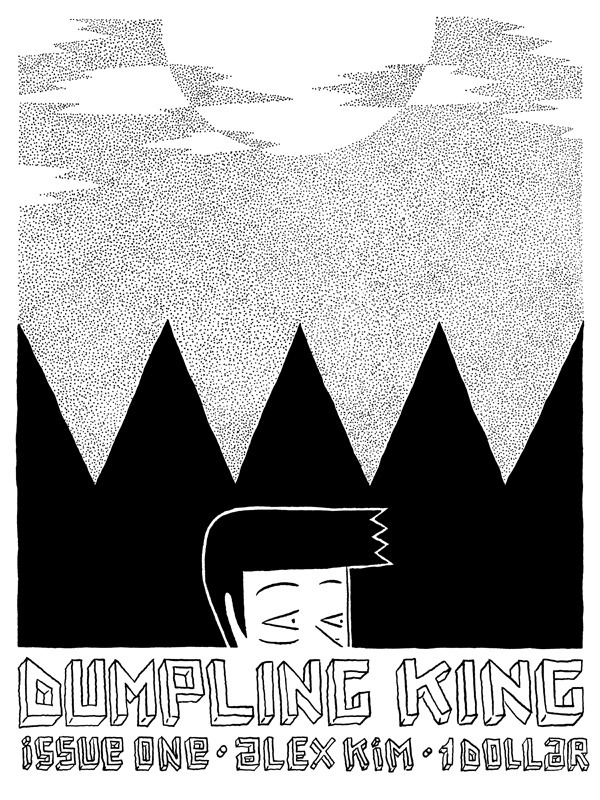 In just 12 pages of glorious black & white, Kim sets up the story of an aspiring dumpling chef after his best friend (a dumpling delivery man) dies under suspicious circumstances (found hanging). Kim swiftly establishes the initial crisis and the relationship between the protagonist and the dead man (best friends) and then deftly reveals how the series will unravel: the chef becomes obsessed with finding out why his friend apparently killed himself, setting himself on the same path with a dangerous but enticing family named Chang, led by the enticing Grace. Though this story is all set-up, there's something wonderfully evocative about the way Kim juxtaposes the mundane, even grimy nature of the restaurant with both the enticing world of the Changs and the general world of weirdness that Kim hints at. It's a very Lynchian concept, filtered through a different cultural context, and those differences will likely prove crucial in terms of character down the line.